In true rock & roll fairy-tale fashion, Precious Metal achieved their first record deal when then Polygram Records President Russ Reagan heard their demo on his car radio on his way to work. Within hours, they were signed. Although defunct, Precious Metal leave a much loved collection of richly diverse rock & roll - from metal to blues, ballads to bubblegum. They are remembered for their flashy & aggressive stage personna, their hook-laden rock anthems, and certainly as one of the most capable groups of female musicians to date. Although defunct, Precious Metal leave a much loved collection of richly diverse rock & roll - from metal to blues, ballads to bubblegum. 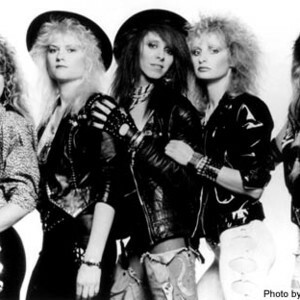 They are remembered for their flashy & aggressive stage personna, their hook-laden rock anthems, and certainly as one of the most capable groups of female musicians to date. This prolific band produced a catalog of over 70 songs, made countless appearances on TV, in films & soundtracks, and toured extensively, winning the admiration of their peers, critics, and fans world-wide. Recently released - a wonderful tribute to the band, What You See Is What You Get - The Very Best Of Precious Metal. The CD contains 21 tracks, many never available on CD before, plus a 12 page booklet of color & black & white photos, most unpublished and from the girls' private collections. PM's "Mr. Big Stuff" video is all the buzz these days...Donald Trump starred as Mr. Big Stuff in the vid, and his newfound TV stardom has the tabloids calling for rare stills and clips.